Hotlist is a social discovery engine that enables its users to view where their Facebook friends and crowds have been in the past, are checked-in right now, and plan to go in the future. 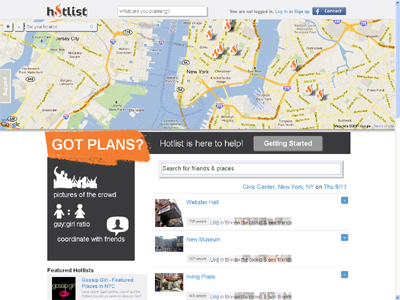 Hotlist enables its users to take a peek inside of venues to see the crowd before heading out. The result is that the website and apps of Hotlist offer the users a simplified way to make social decisions. Hotlist emphasizes social life, and is the only product showing what will be happening in the FUTURE amongst friends & crowds.